The JFP-60 vertical capsule polisher and sorter comes with the function of polishing, loading, and sorting. The inlet of the pharmaceutical machinery can be connected with the outlet of various kinds of capsule filling machine. 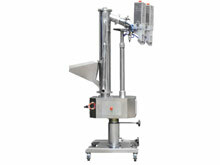 In addition, the outlet of the product is capable of working together with metal detector, realizing joint production. 1. The vertical capsule polisher and sorter is designed with the polishing capacity up to 7000 pieces/minute. 2. It can be connected to the outlet of the capsule filling machine. 3. The empty capsule, capsule fragment, capsule with insufficient medicine, and the broken capsule can be sorted out with this capsule sorting machine. 4. Employing ready-packaged structure, this capsule polishing and sorting machine is quite easy for assembly and disassembly. 5. Conforming to the requirement specified in cGMP, the capsule polishing machine is installed with detachable brush for convenient cleaning. This vertical capsule polisher and sorter produced by FEIYUN conform to cGMP standards. FEIYUN, as an experienced pharmaceutical machinery manufacturer, offers a variety of capsule filling machines, tablet coating machines, medical high purity nitrogen generators, medicine pack blister packaging machines, pharmaceutical sterilization equipment, and so forth. If you want to buy quality pharmaceutical equipment with reasonable price, please let us know and we look forward to working with you!